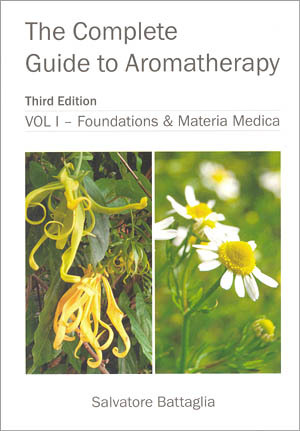 This is the third and latest edition of The Complete Guide to Aromatherapy by Salvatore Battaglia, and it has been significantly updated and revised making it the ideal reference/study book for students and aromatherapists. Entitled, "Volume 1, Foundations & Materia Medica", this massive publication now contains 637 pages, which is 37 pages more than the Second Edition and includes over 120 essential oil monographs. These monographs have undergone a considerable transformation with new sub-sections on adulteration, pharmacopoeias and standards, and a very detailed section summarising the pharmacological and clinical studies. Also included are detailed references, plus a section that indicates if the essential oils are referenced in any other pharmacopeia or standards. Battaglia has expanded the section on 'subtle aromatherapy'; the personality profiling and the energetics of essential oils. There is also a new section on blending for aromatherapy and perfumery purposes too. The latest edition of this book now also includes a new chapter on botany, which is a very useful addition. This new edition explains more about the origins of essential oils and how so many ecological variables can influence their chemistry. This new botanical section describes the botanical factors that influence the quality of essential oils. The 1st and 2nd editions of this book often referred to the ‘typical chemical composition’ of essential oils. In reality, there is no such thing as a typical essential oil composition since oils vary from crop to crop and season to season, due to ecological, climatic and other influences. For this reason most of the essential oil monographs have had the section on chemical composition revised. Many of the actions traditionally assigned to essential oils have been appropriated from old herbals, and experienced aromatherapists know that the properties often attributed to essential oil are not necessarily going to be the same as the herb. This is why the monographs were expanded to include the use of the plant in herbal medicine, and where necessary it is explained that it may be more appropriate to use the herb rather than the essential oil. The 3rd Edition of the Complete Guide to Aromatherapy is destined to become an aromatherapy classic.